Ansem, the Seeker of Darkness is the heartless of Xehanort, created when he used his own keyblade to extract his heart. Ansem was the main villain of the first Kingdom Hearts game, and has remained a vital part of Riku's development throughout the games that have followed. As a heartless, Ansem is cruel, dark, and manipulative. He has also been shown to be somewhat charismatic, having been able to convince Riku to open himself to the darkness which allowed Ansem to possess him, and convincing Maleficent to gather the princesses of heart in Hollow Bastion. 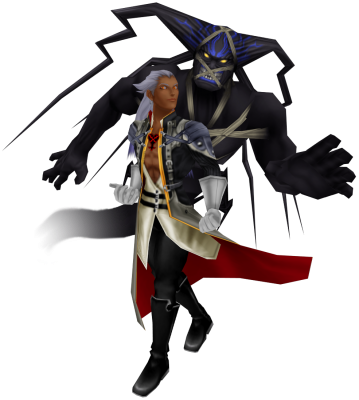 In battle, Ansem is constantly accompanied by his "Guardian", a dark being that constantly sticks to him similarly to a shadow. The Guardian is his main source of attacking, and can also move in front of Ansem in order to protect him from harm. Ansem himself was absent from the games between Kingdom Hearts: Chain of Memories and Kingdom Hearts 3D. However, he did make some cameos of sorts in Kingdom Hearts 3582 Days and Kingdom Hearts II when Riku took the form of Ansem after unleashing the dark power from within his heart. Ansem will appear in Kingdom Hearts III as a member of the "true" organization.